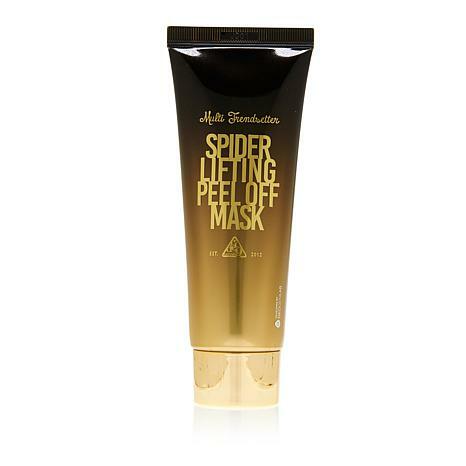 Peel-off face mask that helps remove dead skin cells while temporarily tightening the appearance of skin, and leaves skin look radiant and glowing. Apply an even layer over clean face, avoiding eye area. When mask feels dry, peel of starting around edge corner of chin, lifting upwards. Rinse any excess off with water. Ingredients: Water, Polyvinyl Alcohol, Alcohol Denat, Glycerin, Butylene Glycol, Centella Asiatica Extract, Polygonum Multiflorum Root Extract, Oldenlandia Diffusa Extract, Camelllia Sinensis Leaf Extract, Acetyl Hexapeptide-8, Melaleuca Alternifolia (Tea Tree) Leaf extract, Hamamelis Virginiana (Witch Hazel) Leaf Extract, Hydrolyzed Collagen, Beta Glucan, Phenoxyethanol, PEG-60 Hydrgenated Casto Oil, Ammonium Acryloyldimethyltaurate/VP Copolymer, Ethylhexylglycerin, Gardenia Florida Fruit Extract, Disodium EDTA, Acacia Senegal Gum, Hydroxypropyl Methycellulose, Peat Water, Citric Acid, Proanediol, 1,2-Hexanediol, Potassium Sorbate, Fragrance. this is the most horrible goop ever bought, got it in aug. it was stiff, now it is full tube and totally hardened. it is just awful, stuck with it. never buy this brand again...peel off it does not. This is my favorite mask ever! I look forward to using this. I love how this peels off. My skin feels really clean after using! Love! I loved this mask it really made my skin look and feel better. I don't understand some of the negative reviews. It was very easy to remove and it felt great. I think the price is good for this kind of high end mask. I am 74 and it really uplifted my skin. I will order more today. This is amazing, could tell difference after first use. We are 64 and 22 and both had great results.